So anyway, the lady we live with has been, like, really freaking obsessed with her political blog, and I have tried to be as understanding as I can. Being a sensitive artiste (art is above and beyond politics so, like, I don't want to get involved or anything with the buck naked thing), I understand that the rage to create can become all-absorbing and when it's in, like, full flow it can become an obsession or whatever. Anyways, I've gone easy on the lady because when she goes off on what Sam calls one of her "tangents" we have the man to look after us. But finally, enough was, like, enough. 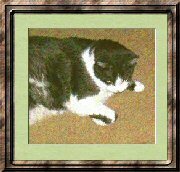 Anways, we got Sam----who Flat Cat and I have both noticed seems to be fully her favorite----to let her know. At first all he did was sit and, like, stare at her really, really pathetically and so on when she was trying to work on her political blog and whatever. But she never even looked up. One day he got up on the sofa next to her and licked her arm as she was typing till it was, like, totally raw. To tell you the truth, it was pretty funny because she was so busy typing that she didn't even notice at first and then when she did it was already too late. Sam felt pretty bad about it because, like, he didn't know what would happen if you lick some skin with no fur on it for about an hour or whatever. And it worked because she let Flat Cat blog again the other day after, like, months (and boy, has he taken it out on Sam and me in the meantime). And today she said I could post some of my most recent artwork and maybe later on, some of my poetry. (1) CAT AND SCREEN. My first is an experiment I've been doing using simple line drawing with really light, clear colors and contrasting textures. This is actually Sam sitting on the screened porch upstairs looking out, but of course as I've said before my paintings are not portraiture, but are more conceptual like, you know, really powerful and at the same time using ordinary images like Sam staring out at the trees or whatever and the trees and the sky showing through the screen. Notice how the cat in the picture suggests, like, the alertness of a cat at the instant after he notices a tasty bird out of reach on the other side of the screen. You can tell by the position of the ears and tail that he's sort of all engaged and stuff and is fully concentrating on something on the other side of the screen. You can practically hear the cat's teeth chatter. And the design also creates this illusion of movement and flashing sunlight and stuff. You know, sunlight and shadow and like that. Stare at it for a minute and you'll see. (2) "CAT AND MICE." This next expresses my unhappiness during the period when the lady had been totally neglecting us for months and I was falling into a state of alarm and despondency and so on. Pain is the mother of beauty, some cat (Sam could tell you which one) once said. It's called "Cat and Mice" and it is a sort of visual joke. It's kind of like a lot of the paintings some of the man friends of the lady I lived with in my last life used to do. It's, like, way more literal than I'd usually consider doing, but I was in the throes of, like, a major depression and the lady I lived with now wouldn't slip me any of her prozac or whatever that stuff is the man is always begging her not to forget to take. So anyway, I made this painting and it is dark yet funny, yet totally insightful and impactful and stuff. And though I shouldn't have to explain it, the man we live with totally did not see it when he saw it. I mean, he didn't get the "mice" part of it. You can see the mice, right? The cat in the picture is me and yet not me, but is, like, my male "animus" (something I remember from my beatnik days when the lady I lived with was very into something called "Jungian Psychotherapy). He is surrounded by, right, computer mice. Hence he is in a state of sadness and confusion, which you can see in his face (which was modelled on my face, but with, like, a more masculine chin, which was sort of an accident because I meant it to be my face, but whatever, the viewer won't know that and subconsciously I was probably reaching down into the depths to my inner angry tom). Seriously, can you see the computer mice? (3) JOY CAT. The next painting is called "Joy Cat" and it represents the same cat (my, like, animus) at the exact second that the lady realizes she has been totally unfair and self-centered and neglectful and is missing out on time she could be spending with her cats, but before the cat has quite realized that finally, at long last, everything has, like, changed. You can see how the picture is dark against the bright background as the cat is realizing. This is the part that is subtle and all that: it's about joy but the cat doesn't yet feel joyful because the joy is only just dawning. You can see the cat is skeptical. I prefer the first, "Cat and Mice" because it plumbs the true depths of the cat's soul at a moment of supreme anguish, but this one is part of the series and the lady said I should include it to show I'm feeling much better now, not that that is the point. (4) THE SLEEPING GODDESS. My next submission is derived from a very, very famous photograph that the lady found on Flickr via something called "Creative Commons" and is used under license blah de blee dah bloo. The lady says I have to give credit to the original photographer, and at first I said absolutely no, the final product is a work of art which first, like, extracts then builds on the essence of the original, and is no more the same photograph than Leonardo's Mona Lisa was, like, Mona Lisa. Like, "The Sleeping Goddess" is a totally totally fully different work from the original. It's a Lydia original. But the lady said, oh no it's not, in that voice that means, like, it's her way or the highway. 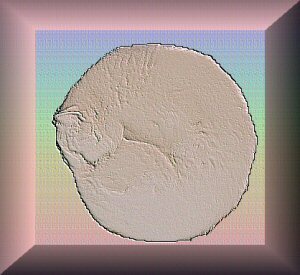 So anyways, the photograph from which my picture is derived is called A SNOWY BALL OF CAT** and the original photo is here and, yeah, it's pretty good. The photographer's name is Ryanne Lai (Laihu) who appears to be a white cat. The lady says I should also thank her for making this beautiful photo available through Creative Commons but, like, a sleeping cat's a sleeping cat, and enough's enough. Art is its own justification, as I am sure this Laihu would agree. To get back to MY picture: you can see that I used a more pastelly palette than is, like, my wont. That's what the lady said. "Lydia, you have used a more pastelly palette than is your wont." It's all, like, rose tones and pale blues, greens, yellows and mauves. 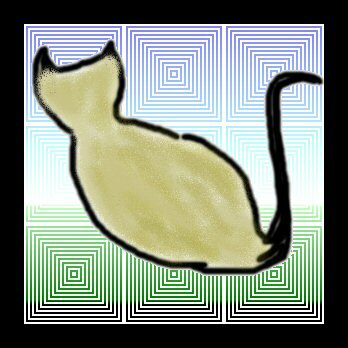 I wanted the contrast between, like, the stony texture of the cat and the flat, metallic look of the background and the raised edges of the "box." Note how this picture truly expresses the essence of the sleeping cat and yet has a, like, feminine quality. 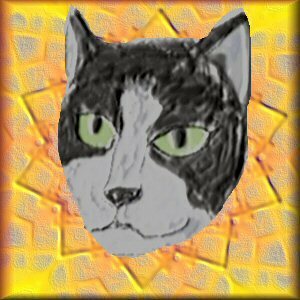 It is part of my "Bast" series and represents the Great Goddess Mother Bast when she takes a break from overseeing the Returned Spirits in the Great Hall. I remember her well from my last return. 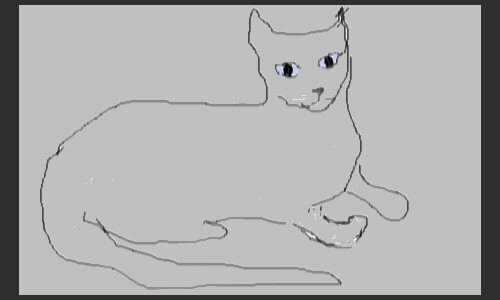 (Sam claims she is a Siamese cat since he's got this idea that Siamese cats like him are the most evolved, but the way I remember her she was sort of silvery grey all over----not pink like in the picture which is "artistic license.") 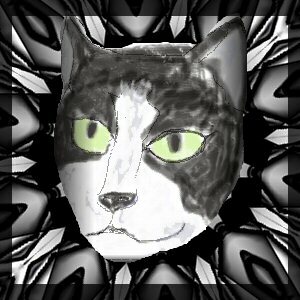 Making pictures of the Great Mother is supposed to be a sacred act for cats, but of course, very few cats can draw or paint like I can. They haven't had the artistic training. (5) SILVER CAT Finally, I present "Silver Cat," which is, quite simply, Sam painted to look the way I remember the Great Mother----all silver. I messed up the right ear a little bit when I was sketching but, like, the viewer will think it's intentional. I thought the other ear was particularly fine, though. Sam modelled this one for me as well and so I gave it blue eyes like Sam but, like, it's not meant to be Sam. It is a representative Cat representing the true essence of highly evolved Catness. You know, like that T.S. Eliot poem: "The thought of the thought of the thought of his name," or whatever. That's what this cat is thinking of. It's all ineffable and stuff. **We don't own the rights to "A Snowy Ball of Cat"! Don't use it or download it till you check out the terms of the Creative Commons license!! The Friday Poetry Corner. HAIKU BY LYDIA. Flat Cat Presents STUPID LYDIA'S LAME SO-CALLED PORTFOLIO because the lady said I can only have my own blog if I SHARE.